Heat engineering, including heat and mass transfer, combustion processes, environment protection. Papers published earlier in the journals will not be accepted. In 2016 Ministry of Science and Higher Education in Poland assigned 9 points to Metallurgy and Foundry Engineering. 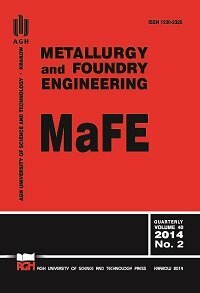 In 2015 Ministry of Science and Higher Education in Poland assigned 9 points to Metallurgy and Foundry Engineering (see the respective journal ranking list published by the Polish Ministry of Science and Higher Education on 23.12.2015).